BANGI, Nov 18 2013 – The Goods and Services Tax (GST) likely to be implemented next year as proposed in the 2014 budget tabled recently in parliament, will help ease the country’s fiscal deficit. Panellists at a forum organised by The National University of Malaysia (UKM) here today agreed that introducing of the GST or Value Added Tax (VAT) is inevitable in order to slash the national debt which is now stands at nearly 55% of Gross Domestic Product (GDP). The panellists were made up of Datuk Dr John Anthony Xavier, a visiting professor of management at UKM’s Graduate School of Business; Datuk Dr Denison Jayasooria, Principal Research Fellow, at the Institute of Ethnic Studies (KITA) and Nor Zahidi Alias, chief economist at the Malaysian Rating Corporation Berhad (MARC). Professor Datuk Dr Noor Azlan Ghazali, who is Head of Economics and Management Cluster of the National Council of Professors also took part in the forum. He described the government’s move to trim fiscal deficit by 3% at end of 2015 supported by various reforms on revenue generation and expenditure control, as bold and necessary. The forum titled Fostering UKM Denizens to be Responsive to the Economy was moderated by Prof Dr Mansor Jusoh of the Faculty of Economics and Management. 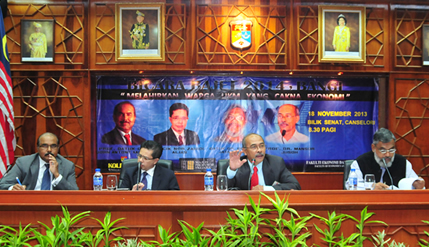 This was the second economic forum on the government’s budget organised by the Dato’ Onn Residential College. Prof Xavier said with only 16 per cent of workers paying tax, unsustainable oil revenue and trade liberalisation, GST is the only way to increase much-needed revenues. At present the Sales and Services Tax (SST) is used to collect revenue from businesses. Malaysia, he said, is a laggard when it comes to implementing GST. When Malaysia does introduce GST, it will be joining 160 other countries, or 80 per cent of the countries in the world, including seven other Asean countries which had already used the GST. While many taxpayers may be more accepting, many others oppose the GST on the grounds that it is a “money machine” for the Federal Government. They argued that the government should not be given a lifetime pass to further raise taxes. However, the bottom line is that the government needs to raise its revenue if it wants to continue Malaysia’s trajectory to becoming a rich nation. Prior to joining UKM in 2012, Prof Xavier was an Administrative and Diplomatic Officer (PTD) for 36 years in the Malaysian public service. Dr Denison, who is also a Human Rights activist, said the ordinary people would certainly appreciate the increased one-off hand-outs announced in the budget to ease their present hardships. Prices of goods have already increased even before GST is implemented. He cautioned that the gap between the haves and have nots is growing saying that the rift is already wider than ever. Dr Denison also said that a lot of money could have been saved in the past if there had been serious moves to clamp down on graft and inefficiencies in the government. Nor Zahidi urged more efforts be carried out to address the macro economic imbalances when welcoming the government’s move to introduce the real property gains tax (RPGT) within the first three years of disposal upon the signing of the sale and purchase agreement coupled with the removal of Developer Interest Bearing Scheme (DIBS). Nor Zahidi said those measures will help curb speculation to a certain extent but felt that imposition of RPGT be imposed on disposals of properties for up to five years at least after purchase. He also praised the move to reduce subsidies, such as for petrol though there will be some suffering among consumers, especially in the urban areas of the Federal Territory, Kuala Lumpur and Putrajaya, where private transport is most needed. He expects more adjustments in petrol prices in the first quarter of 2014 after the budget dispute in the United States between the Whitehouse and Congress subsides saying that petrol subsidy is going to be the focus in subsidy rationalisation.